The XF 23mm F/1.4 has historically been one of the best lenses in Fuji’s line-up that many don’t even consider, and even fewer actually buy. There’s one very good reason that, the X100. At almost ⅔ the price of a whole fixed-lens 35mm camera, you have to really need that extra stop, sharpness, and/or instantaneous visual confirmation of manual focus zone. But I’m getting ahead of myself. The XF 23mm F/1.4 is a fantastic piece of glass, and could still be worth considering for the Fuji shooter who already has an interchangeable body, and wants to add the best Fuji has to offer at a 35mm equivalent to their arsenal. Let’s have a look. Pretty standard XF mount quality here. By the time this lens was released, we were still a ways away from peak build on a time scale, but I would say about 80% of the way in quality. This is not a lens for which you need worry much about sample variation, in my experience. When it was released it was on the larger end, but now it can be considered medium-sized for Fuji. In fact, it’s the smallest of every prime lens Fuji has released since with the exception of the F2WR lenses. Without either hood, about a sixth of the frame is blocked by the lens. It’s on this side of usable, but barely. If you’re the type who keeps their hood glued to their lens, you’ll likely stick to EVFs. At its release, I was quite pleased with the aperture ring found on the XF 23mm F/1.4. Since then, almost every prime released has improved upon it slightly. A tighten here, and damp there. I don’t think many would be terribly disappointed with the aperture ring on the XF 23mm F/1.4, but it could find its way out of the users setting without their knowledge, so it’s worth noting. The hood that comes in the box is plastic and enormous. So large that aside from testing, I don’t think I ever used it. A lot of photographers I knew at the time went on the hunt for replacement hoods to varying degrees of success. When Fuji announced that the XF 16mm F/1.4 WR would have an aftermarket accessory hood, the first lens that came to mind as a candidate for it’s own fancy metal hood was the XF 23mm F/1.4, followed closely by the XF 14mm F/2.8. The former has indeed received it’s own metal hood in the LH-XF23. We’re still waiting on the latter. Anyway, the LH-XF23 is an excellent hood, but on my sample the plastic cap does not stay on the hood like it does on the LC-XF16. It’s so bad I leave the cap at home. The accessory hood is also heavy. It’s about the same amount weight added as the XF 16mm F/1.4 WR’s adds, but on a lens that’s nearly 80g lighter, you feel the difference a bit more. Still, I would take the weight over the size of the plastic hood in a heartbeat. In general, this is a lens that really does not see much hood use. I’ve written many times before that I often like a little flare and ghosting in my images. You can probably get away with shielding the lens with your hand most of the time. I would recommend mostly keeping it small and leaving the hood at home. If you do want a shade, the LH-XF23 is a more compact, discrete choice. That’s a lot to say about a couple hoods. Pull the manual focus ring in towards you and you’re focusing manually. 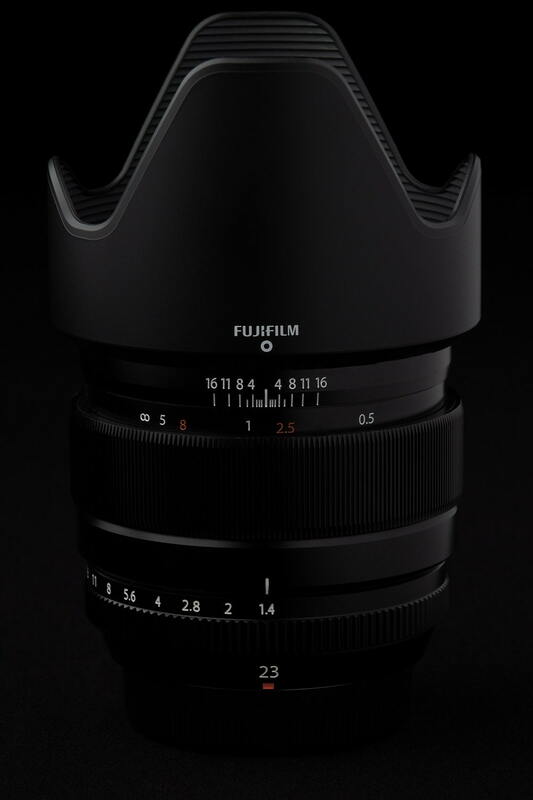 I love this, but unfortunately there are just three lenses in Fuji’s lineup that offer it, with the XF 14mm F/2.8 and XF 16mm F/1.4 WR being the others. Some users might find the clutch ring an annoyance rather than a feature since it it can certainly get in the way of using the AF+MF setting that was released via firmware after the clutch ring came out. Overall, I would prefer consistency across the lens lineup. Too bad the three lenses that do have the clutch focus ring are of such good quality they can’t be ignored. Another feature restricted to just the XF14mm F2.8, XF16mm F1.4 WR and XF23mm F1.4. The more I use lenses with a proper depth of field scale, the more I miss them on lenses that don’t have them. There is none, and that’s a shame since it would have been another point of differentiation between it and an X100. It must be noted the XF 23mm F/1.4 was released over a year before Fuji’s first weather sealed camera, the X-T1 was even announced. Sadly, for weather sealing at 35mm equivalence, Fuji shooters are left having to compromise image quality at least somewhat. The XF 23mm F/1.4 is sharp. Not crazy sharp, but sharper than anything else I’ve used at 35mm from Fuji. 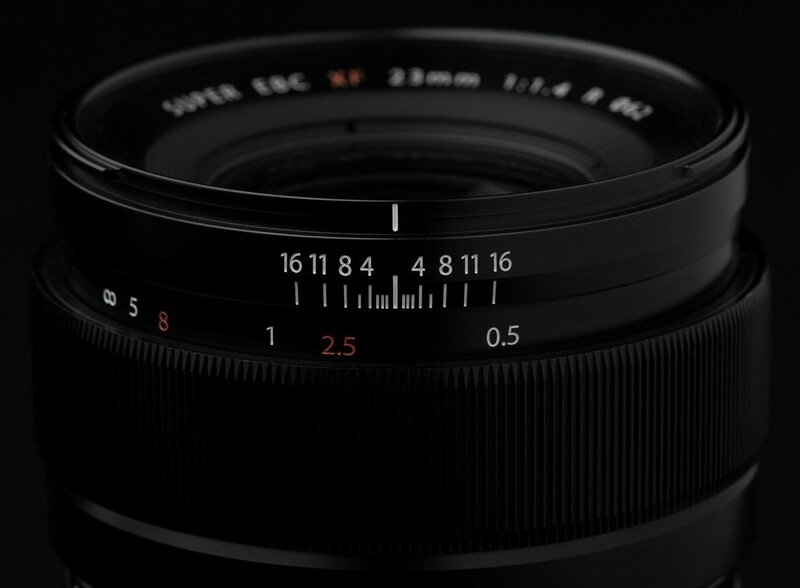 X100 owners will see a jump in sharpness, as will XF 23mm F/2 WR and zoom lens owners. Expect some softness in the corners at the widest apertures. Things tighten up in all but the extreme corners up by f/2.8, and the whole frame is very good by f/4. One thing to note, the XF 23mm F/1.4 seems to have one of the fastest diffraction drop-offs of any Fuji prime. Between f/8 and f/11 the lens loses more sharpness than I find acceptable. Typically I’m comfortable shooting through to f/11 on Fuji lenses, but I would need a really good reason to go much beyond f/8 when shooting RAFs with this lens. With JPEGs, Fuji sharpens images up in camera uncannily well. So well you might think about adjusting the sharpness setting down, lest you end up with halos around high contrast areas. Distortion is so minimal, I had to double check that I had turned my lens profile off. This is one lens where Fuji’s in-camera correction can relax a little. The contents of your background, and the distance from your subject will matter a lot when it comes to the bokeh of this lens. In some cases, the bokeh is just a lovely blur of colour, but if you have blades of grass, close to the background, or high contrast objects like bare trees against a bright sky, it can start to get a little messy or “nervous”. The samples below tell the story better than I can in writing. Pronounced when shooting wide open in RAFs, but largely corrected in JPEGs, and negligible stopped down a couple times. It’s just ok for me. The 7 blade aperture likely has a lot to do with that. I have a tough time getting decent sunstars with this lens, but I’ve seen good examples of it. I see a minimal amount between f/1.4 and f/2.8. Virtually imperceptible by f/4, and all correctable in software. The provisos mentioned in the introduction are compounded for me by the fact I don’t really get on all that well with 35mm. This is 100% a preference while shooting, as opposed to the output. I love 35mm photography as captured by other photographers, and I appreciate the focal length for environmental portraits, intimacy when used up close, etc. It’s just something I personally struggle with. It’s a focal length I do a lot of cropping in, or wishing was a little wider. All that subjectivity aside, if 35mm is your preferred field of view, and you can get by without weather sealing, this is a piece of kit you must consider. Then also consider the price, and that there is a smaller, weather sealed alternative at literally half the cost that will not block anywhere near as much of an X-Pro’s optical viewfinder. As with Fuji’s two 35mm lenses, you only lose one stop of light gathering when opting for the smaller, weather sealed varient. Unlike the 35mm, there’s a notable drop in image quality in my testing. Finally, the X100. If the XF 23mm F/1.4 was $100 less, the X100 would be enough of an added expense that the prime would be easier to recommend over another whole camera. My money would go towards an X100. If you’d like to purchase the XF 23mm F/1.4, or anything else for that matter please consider using one of the affiliate links below. The price is the same for you, but a small percentage of the purchase price goes to me, which really helps keep this site going. Thank you. F/1.4 at Infinity, 1/15th of a second. Environmental portraiture is where this lens shines. I cropped this one a bit though. If you’d like to purchase the XF 23mm F/1.4, or anything else for that matter please consider using one of the affiliate links below. The price is the same for you, but a small percentage of the purchase price goes to me, which helps keep this site going. Thank you.